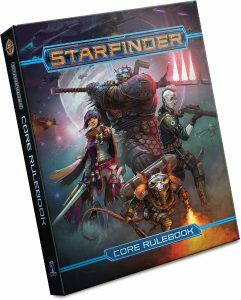 REDMOND, WA (August 7, 2017): Nearly a decade after Paizo Inc. released the award-winning Pathfinder Roleplaying Game, the countdown is now on to celebrate the release of the company’s newest game, the epic science-fantasy Starfinder RPG, set in the far-future of the world of Pathfinder. Along with the release of Starfinder’s Core Rulebook and first Adventure Path, Dead Suns, at Gen Con (August 17 – 20, Indianapolis), Paizo will host a line-up of gaming events and activities for any Pathfinder or Starfinder fan attending the show. Players can travel to the stars or explore Golarion with 24-hour gaming in the Sagamore Ballroom, including the now-legendary 1200-player Pathfinder Specials. Other events in the Sagamore include Pathfinder Society Adventure Card Guild Open Tournament, a new multi-table interactive Pathfinder Society Scenario, new quests, a pre-generated character special and three scenarios for Starfinder Society. Participants will receive collectible buttons, while supplies last. Members of Team Paizo will be on hand to meet attendees throughout all four days of the show in the Paizo booth (#103) and hand out new collectible buttons each day. Attendees who shop in Paizo’s booth and spend $50 or more will receive a promotional Blue Knight mini, while supplies last. Paizo Inc. is publisher of the award-winning Pathfinder Roleplaying Game, Pathfinder Adventure Card Game, Pathfinder Tales novels, as well as board games and accessories. The Pathfinder world, in which players take on the role of brave adventurers fighting to survive in a world beset by magic and evil, is currently translated into eight languages, and has been licensed for comic book series, graphic novels, toys, and apparel. Paizo.com is also a leading online hobby retail store, offering tens of thousands of products from a variety of publishers to customers all over the world.